SeemBee App for iPhone. As a Beta Tester I go though several app son a day looking though their positives and their negatives and their applications in our day to day lives. Off all that I have seen today, I would say that this is an app that has really gotten me. I believe in keeping apps on my mobile more for a specific purpose and very few for fun. This is an app of purpose and if I might say, it does serve its purpose pretty well. The app basically deals with storage of information, which could be formal or informal. All you need to do is click on the information that you want to save, and save the picture with a note, that is either typed in or saved through a voice recording. The details can be anything from a sight that you wanted to remember or a bill on a piece of paper or an important address that you wanted to make note off. 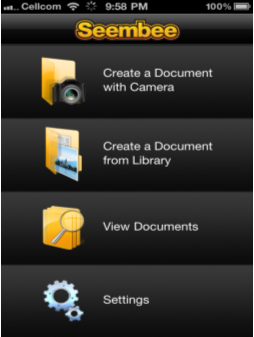 All the documents that you save, can be given a tag and neatly locked up in your iPhone library. And when you want to go through it all you have to do is type in the tag and you have got the information that you need. No more searching helter-skelter for things in your bag or on your desk, its all just one touch away. Well there’s more, your mobile can be synced in with the web and the details can be sent across and saved on the web as well so it can be accessed in the absence of your mobile anywhere and anytime in the world. This is done by creating an account on “SeemBee’s” website. Now you can carry information, important documents and even treasureable events of your family in your mobile all through a click and save technology that even keeps you connected with the world through the web. Now what if you want to mail out some important details to a friend, no more downloading to the Pc and sending it out, you get direct access to mail through “SeemBee” as well. Now, just by sitting in your chair with your phone in your hand your just a tap away to all the information that you need. Now who could want more. “SeemBee” is the most self efficient app of today. 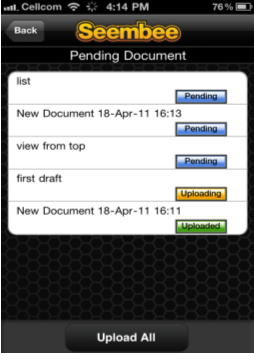 Seembee iphone app will be available on the app store worldwide in very few days! Internal projectors coming to the iPhone/iPod touch!